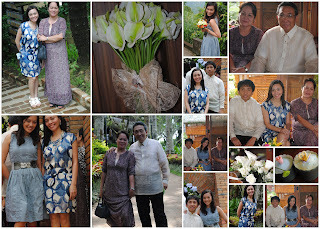 the original plan was to go to tagaytay via manila for my cousin's wedding. then on the last minute, the carrier informed me of a cancellation that i had to move the flight from cebu-manila to tagbilaran-manila instead. we arrived manila around lunchtime and after a series of mishaps, arrived in tagaytay at 6 in the evening, much much later than we were supposed to. anyhow, despedida de soltera party started. 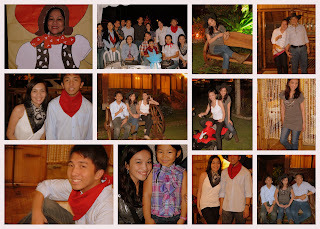 it was an outdoor cowboy-themed party @ the hotel in Tagaytay, Bali Resort Hotel. the wedding was held at the chapel on the hill, caluruega. it was very scenic and beautiful. the chapel was packed with friends and relatives of the couple. reception immediately followed at sonja's garden. we headed back to manila. coincidentally, J was still on BT at Manila so it really fell into place to catch up with him. when we bought the tickets for this trip, we didn't know that J would be there nor of my upcoming overseas assignment, so it came as a pleasant opportunity to spend time with friends from Manila as well. 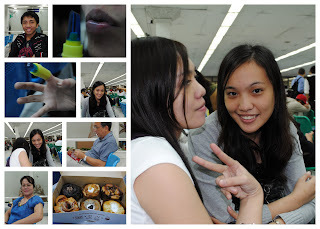 days were spent catching up with Manila friends. it was malling and meals @ Racks and Bubba Gump. i would've wanted to met up with everyone but i was running out on precious time, plus the typhoon Juan did not exactly make things easier. due to the typhoon, the 1.30 trip was moved to 2.30, and then later on to 3.30. it was spent primarily on the airport. good thing, my family who were headed for tagbi had their 9AM flight moved to 3PM so the wait on the domestic airport wasn't much of a drag.